That there is a need to reverse the downward spiral of trust and perceptions of the global financial services sector is not in doubt. As some markets begin to see signs of recovery and confidence grows, the reputation of the industry remains at all-time lows, with the 2014 Edelman Trust Barometer once again ranking banks the lowest of all industry sector groups. Trust breeds confidence, and without confidence savers will not invest their capital with borrowers, or invest for the long term in pensions or other financial products. Quite clearly, this would not be a sustainable future for the global financial markets if participants cannot trust the markets to deliver reward in exchange for risk – in a transparent and ethical fashion. Fundamentally, whilst economic recovery may be on the horizon, the uncomfortable truths revealed by the financial crisis and its aftermath will not easily be forgotten, and cannot be resolved simply by a return to growth. Ongoing scandals around practices of mis-selling, fraud, excessive reward of high risk and ‘turning a blind eye’ to corrupt and unethical conduct, have shown that for too many professionals their work has become disconnected from its original purpose. That purpose should be one of serving the client first to help them make the best decisions to secure their financial future, with the ultimate goal of creating a stable, prosperous society. Instead, the perception of the investment industry is one that serves the professionals first and incentivises the worst kinds of behaviour. Attitudes must change, and this change needs to come from the top. A report titled “A Crisis of Culture” by the Economist Intelligence Unit sponsored by CFA Institute asked c-suite industry executives about their attitude towards ethical conduct. Whilst the overwhelming majority of those surveyed acknowledge the importance of ethical standards being in place within their organisation, 53 percent believe it is necessary to be “flexible” on ethical standards to progress in their careers. This suggests that in some instances the introduction of ethical codes and processes pay little more than lip service to actually addressing the issue, and is not taken seriously at all levels of organisations. Our own members see this too, with over half of CFA charter holders stating in our 2014 Global Market Sentiment Survey that they believe that the lack of ethical culture in financial firms has been the biggest contributor to the lack of trust in the industry. There are a number of ways in which organisations, led by senior executives, can introduce meaningful ethical standards and compliance. These include: emphasizing the importance of company protocols as part of induction programmes; encouraging an atmosphere that fosters confidence in speaking up and reporting concern about violations or potential conflicts; sharing examples of challenges have been faced and resolved; training and education for staff at all levels, both client facing and in a range of other critical functions such as IT, HR, accounting and legal. 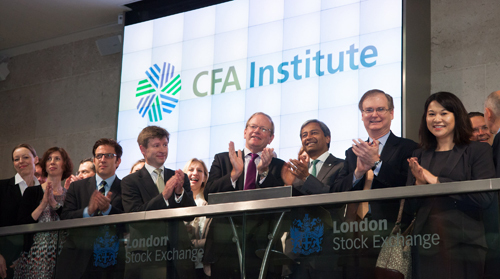 In 2013 CFA Institute launched the Claritas Investment Certificate as a tool to help address knowledge gaps that have been identified across the industry. This programme is designed to be an introduction to the fundamentals of the investment industry to help those in the a number of professionals operating in the sector – we estimate that for every investment professional there are 9 other professionals also participating in the industry in fields such as IT, HR, and journalism – to help them better understand some of the complex concepts and terminology involved in investments, as well as their role in the wider industry. There are numerous instances of catastrophic crises which have brought down entire institutions or markets that perhaps could have been avoided if someone in a role such as IT or administrative support had felt educated and qualified to question actions they were being asked to take, or to report concerns. Being alert to these issues, and taking a broader look at our industry, is part of a call to action that we are CFA Institute are promoting: ‘the future of finance starts with you.’ This is a simple concept: from the c-suite of an investment bank to the recruitment companies hiring new staff and the accountants auditing financial statements, all those operating in the investment industry should take action to ensure the best decision-making and most responsible conduct. This is a win-win proposition, because if those working in and around the sector are better educated about each other’s functions, and more aware of the common objective to service clients ethically and well, they can provide better services and solutions to one another which help deliver on that goal. Likewise, there is also a role for investors themselves – a responsibility to be engaged shareholders and savvy investors, who ask questions, educate themselves about different products available, and scrutinize the information available to them. This creates a system of fiduciary capitalism – the idea that shareholders and investors can influence the financial services industry for good.